My family visits Hershey all year round, but summertime is our favorite time. Hersheypark is open daily so we can swing by with our season passes for just a few hours in the evening, or meet up with friends on a whim. It’s the perfect summer vacation town and if you were thinking that the only thing to do with your kids is play it up at the Park, I’ve got a whole list of ideas for you, some of our favorite spots to enjoy when we’re in the Sweetest Place on Earth! Read on for my list, plus a giveaway for a family 4-pack of tickets to Hersheypark for the 2017 operating season! Obviously #1 on the list! Hersheypark is our favorite thing about Hershey, PA. And if you’re local, a season pass will pay for itself within 3 visits so keep that in mind when planning your summer. There are rides for every level of thrill seeker, including 13 coasters and the brand new Hershey Triple Tower! Here are my top 10 tips to make the most of your day, plus our favorite family-friendly rides. On those hot summer days, the Boardwalk is the place to be. Cool off on water slides and pools that are perfect for even the littlest guests. The lazy river, or Intercoastal Waterway, is our favorite! Admission to ZooAmerica is included with your Hersheypark tickets, OR you can just hit the zoo separately. ZooAmerica is the perfect day out for families with young kids. It includes so many neat animals (and some exhibits are indoors which is a nice break from the heat). It’s just the right size to take in over a few hours – not overwhelming with little ones. We’ve been going here for years for a fun day trip. My husband and I love it as much as the kids! Concerts are held at three main venues: Hersheypark Stadium, GIANT Center, and the Hershey Theatre. All of these venues are awesome. The Stadium is outside, the Theatre is GORGEOUS and more intimate, and the GIANT Center brings in some huge talent! This summer you’ll find Kidz Bop, Train, Luke Bryan, Guns N Roses, and so many more. Find the complete entertainment calendar here. There’s definitely enough to take in in Hershey that you will want to consider making a couple-day trip out of it. When you stay overnight at The Hershey Lodge, you get to play at Hershey Waterworks at Hershey Lodge. Where else can you get a Cocoa Massage? The Spa at The Hotel Hershey is one-of-a-kind pampering. Take your girlfriends, your teen daughter, your Mom, and go make a day of treating yourself. Their menu of massages, facials, and specialty treatments almost makes me hungry. Sign me up for the Chocolate Immersion, please. The Harvest Restaurant (located at The Hotel Hershey) is absolutely delicious! The Cocoa Beanery (located at The Hershey Lodge and The Hotel Hershey) is the perfect stop for a yummy baked good and a coffee. The Circular Restaurant (located at The Hotel Hershey) is a must-do for their breakfast buffet. Chocolate Bread Pudding! Fire and Grain is a brand new restaurant (located at The Hershey Lodge) opening May 2017. Admission to Hershey’s Chocolate World is FREE (can’t beat that!) and you can ride Hershey’s Chocolate Tour for free too! If you want to spend some extra time there, there are a bunch of add-on options like make your own candy bar, a chocolate tasting class (we loved this one! ), and a 4D movie. Also, buy all the chocolate before you leave. This is where you are going to find the absolute best selection of Hershey candies all in one place! Did you know that one of the three official Hershey resorts is Hersheypark Camping Resort? And whether you’re the pitch-a-tent type camper or the ‘glamper’ (that’s me, the glamper), they have the coolest environment for your family to stay and play this summer. The Deluxe Cabins will make you feel right at home, while roasting s’mores on the fire pits at night will make you feel like you’re in the great outdoors. This is the best of both worlds for me! See more photos of my time at Hersheypark Camping Resort here. 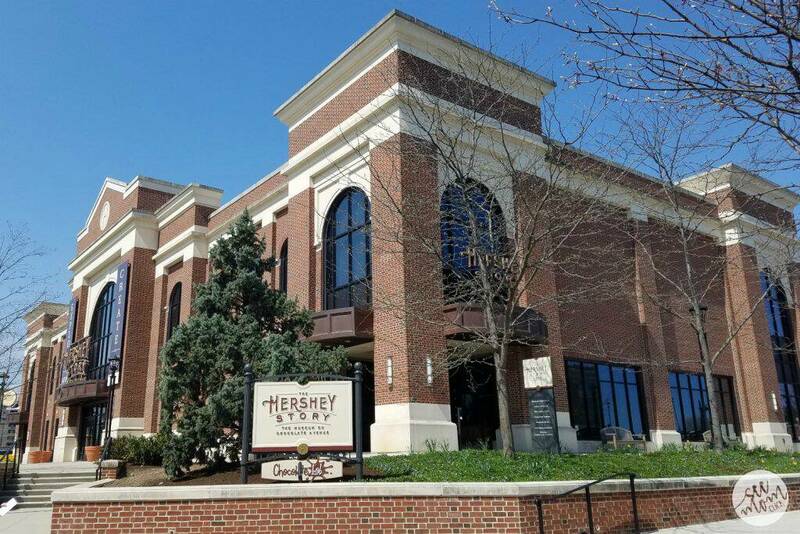 The Hershey Story Museum is located right on Chocolate Avenue in the heart of Hershey, and it’s filled with informational and interactive exhibits that tell the story of Milton S. Hershey, and the town that he built around Hershey Chocolate. was just there a few weeks ago on a field trip with my son’s 2nd grade class and the kids loved it. They particularly loved the Chocolate Lab (this is an add-on activity) where they learned the secrets of making chocolate and get to try their hand at creating their own candy bar! *Tickets to The Hershey Story Museum are included in your overnight stay at The Hotel Hershey and The Hershey Lodge. We’ve always loved Hershey Gardens for their stunning landscape and fun places for the kids to explore outside. Our 5-star review was bumped up another level last year when they opened the Butterfly Atrium. This is open year-round and features 500+ butterflies from around the world. You can get up close and personal with them, and they are GORGEOUS. *Tickets to Hershey Gardens are included in your overnight stay at The Hotel Hershey and The Hershey Lodge. Hershey Entertainment and Resorts is generously sponsoring an AWESOME giveaway for my readers! One lucky duck will win a family 4-pack of tickets to Hersheypark, valid during the 2017 operating season. This giveaway is open to US residents only, ages 18+. And please make sure you can actually get to Hersheypark this summer before entering! It will end at 11:59pm ET on May 22, 2017. Good luck! We have never been and are taking a family trip to philly this summer. Hershey park looks like so much fun! Hershey Park has a ton of things for every age! My oldest son will love the thrill rides, and my youngest toddler will be so excited to see the animals at the zoo! How neat that they are connected! I would love to win! We love Hershey Park; I would love to take a trip there this summer!! My daughter loves the rides. This would be a great adventure for us. Education and fun! My family and I love amusement parks. Would love to visit this one! I want to go because I’ve never been there! I would love to win tickets to Hershey Park! It looks like they have some fun new rides this year our family will love! My sons love Hershey Park, love to be able to visit this summer. I would love to take my daughter to Hershey Park this year ! Last time I was there I was pregnant with her went to a concert and to chocolate world had a blast my daughter is almost 4 and would definitely enjoy going. I would love to go as I have never been. I love Hershey’s chocolate anyway, I’m definitely a chocoholic!! Would be fun to visit!! I would love to win because I would be a wonderful day trip for my family. It has been years since I have been to Hershey park and I would like to see all the changes. My best friend and I are taking our families on vacation together in July. We can’t wait to visit Hershey Park and the surrounding area! I would love to take my kids for some chocolate park fun! We’ve been to Hershey 3 times. Last time we had so much fun! My daughter’s birthday is in July and she wants to go to Hershey and take her best friend for her birthday. She wanted to go last year but we had not long before taken in my father in law from his stroke and we could not leave to take them for her birthday. Hopefully, the person that says they will stay with him does not back out on us again and we get to take her or she will be one sad girl. These would be a great help because then we could stay overnight up there since we would not have to buy tickets. I want to go to Hershey Park because I have not been there since I was a child and I remember the great fun I had with my family. I would like to give my family the same experience. I can’t believe we have never taken the kiddos to HersheyPark! I want to go this summer, and see if it is all I remmeber from my childhood. I am big on passing things on to the next generation. I want to take my family to Hersheypark because we have never been there before, and we love amusement parks … and chocolate! I would like to go to Hershey Park with my niece and nephew. My nephew is getting to the age where he is starting to like rollercoasters. I think he would enjoy the theme park. I would like to go to Hershey Park because my kids love the ride. Of course, we all enjoy shopping in the gift shop too afterwards! My hus band took a trolley ride on a business trip to learn more about Hershey. I’d love to celebrate a year of hard work with my kids and make it educational as well by fitting in a trolley ride. Thanks for the chance! I’d love to take my kids on the Chocolate World ride! Visiting HersheyPark each year is a tradition our family has loved since our children were little. The kids love seeing how much they have grown as they measure up against the candy charts each year and look forward to riding new rides as they grow. There is nothing greater than enjoying making memories as a family and HersheyPark is one of our favorite places to do that each summer! Thanks for the chance! This would be an amazing treat for my family after the rough winter we had medically. It would be great to just enjoy ourselves,at Hershey Park! Thank you for the chance. Would love this! We’ve only been to hershey park once that was 3 years ago, my kids have been begging to go back. It would the perfect way to spend my youngest sons upcoming 7th birthday! My kids have been begging to go to Hershey Park! I went as a little kid. I would love to take my kids and let them experience it too!